or maybe it was reading a short piece on the Israeli prime minister’s recent statement that it was the Palestinian Authority’s decision to seek involvement in various UN activities including the Geneva Conventions that was undermining peace discussions, or maybe it was the shooting at Ft. Hood. I don’t know what specifically triggered this blog today, but surely all these things contributed. As author David Swanson makes so clear, the possibility of abolishing war begins with believing it is possible. It was the same necessary first step in ridding the world of slavery. Or maybe it was Rebecca Solnit’s piece in Today’s Guardian, Call Climate Change What It Is: Violence. Yes as the War Resisters’ League pie chart above makes abundantly clear, the forces for war and violence are aligned against those who believe in its abolition. President Eisenhower’s parting alarm about the military-industrial-complex has come to pass. 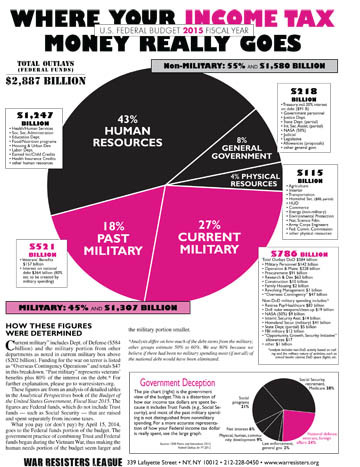 Forty-five percent of our taxes are spent for military efforts. We have bases and soldiers, and increasingly private profit contractors housed all over the world. Abolishing war and violence is possible, if we think it is possible. David Swanson clearly thinks it is and marshalls a strong case for its abolition. Like slavery, those of us in the senior age category are not likely to see its complete abolition in our remaining years, but how can we not work with everything we have to make it more likely that our children or grandchildren will know it and enjoy it? Milton Friedman. Capitalism and Freedom, p.2 (cited in Rob Dietz and Dan O’Neill, Enough is Enough, 2013). Our children and grandchildren deserve our best efforts….